“Insanity is often the logic of an accurate mind overtasked.” Oliver Wendell Holmes, Sr. The purported link between insanity and genius is, of course, a well-trodden theme in popular culture; we need only think of Russell Crowe’s portrayal of John Nash in A Beautiful Mind, or of Dustin Hoffman in Rainman. As a result, the ‘mad genius’ trope does set alarm bells ringing, particularly because the causative connection between mental illness and the work of logicians has been persuasively challenged (see, for example, this blog post). This raises the question of the extent to which the mad genius cliché is really just used to ostracise or at least stigmatise part of the intellectual community. After all, it is much more comfortable for people generally if high intelligence and the study of complex mathematics is confined to a category of the population with personality disorders. Notwithstanding the above, the idea that many great logicians were driven insane by an obsessive dedication to their work does make for a compelling narrative. In many ways, madness represents the polar opposite or obverse of the coherent framework these thinkers were trying to achieve. To this extent, the fear of insanity must have been very real. In Logicomix, Bertrand Russell is the vehicle for expressing this fear, and he is shown as tormented not only by his encounters with mad logicians, but also by the knowledge that his family has a history of mental illness. And yet, Russell is also presented as the most human of the thinkers engaged in the quest for foundational mathematics. He fervently protested against what he saw as the madness of the First World War, had numerous passionate relationships with women, and was involved in several radical experiments in education. In this way, Russell becomes a sort of human conduit to the netherworld of foundational mathematics, a twentieth century Virgil tasked with guiding the reader towards an understanding of what the quest was really all about. Interestingly, the narrative is framed as a talk given by Russell at an American university entitled “The Role of Logic in Human Affairs”. Moreover, the talk is given on 4 September 1939, the day the UK declared war on Germany after the invasion of Poland. As a result, Russell is confronted at the gates of the university by a crowd of anti-war protesters advocating that the USA play no part in the escalating European conflict. Russell invites the protesters to hear the lecture he is due to give, noting that “I will be speaking about reason, in its highest form: logic!” Of course, in introducing his lecture audience to the foundational quest for mathematics he does the same for the humble reader, thus acting as a guide both within and outside the text. In this way, Russell becomes a narrative symbol for accessibility, which is surely the overriding objective of the book as a whole. 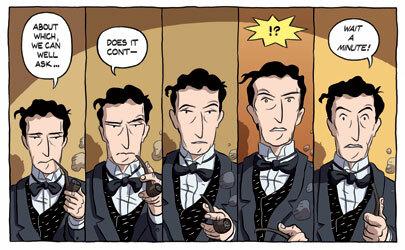 Of all the ways to be introduced to the work of the great twentieth century logicians, Logicomix as a graphic novel must be the most approachable.